Sovereign Sports offer construction and maintenance services throughout Canterbury for tennis courts and all-weather sports surfaces. We are hugely experienced when it comes to planning and constructing sports surfaces and tennis courts to LTA and SAPCA regulations. We regularly provide our services to schools, councils and local sports clubs as well as private gardens and properties. You can get a free quotation from us today as well as friendly, honest advice from our experienced team so that you are well informed prior to the construction of your new sporting surface. 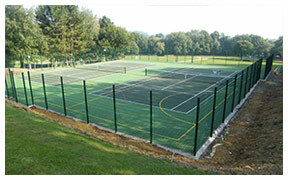 We are specialist contractors and have many years experience constructing sporting surfaces and tennis courts. You will find many of our MUGA surfaces and tennis courts in use across Canterbury in private homes, local clubs and schools. We can arrange a no obligation site visit to take a look at the area you have designated for construction or to review an existing surface, providing you with all the necessary information. Canterbury and other parts of the South East take full advantage of our high quality sporting surfaces and they have grown in popularity over the years, with one of our most requested construction projects being the textural porous macadam surface. We construct many other surfaces including synthetic grass for hockey, football and other sports. 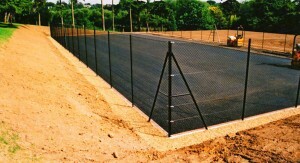 We can also build artificial grass and synthetic clay courts. Our high quality MUGA surfaces include Matchplay 2 synthetic, multi-sport and 3rd Generation FIFA 1 Star equivalent standard pitches. We also provide existing sporting surfaces and tennis courts with maintenance services, with essential maintenance work playing a huge role in keeping a surface in the best possible condition. 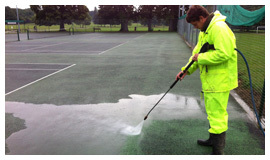 We will sweep away leaves from courts and collect rubbish as well as power wash open textured surfaces so that they are moss-free and slip resistant. We will also freshen up synthetic grass using a specialist brooming service and colour spray discoloured surfaces for a fresh, like-new appearance. 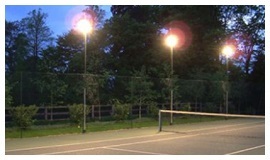 For courts regularly in use during the winter and overnight we can provide retractable and static floodlighting installation services. Planning permission may be required for floodlighting installations should you wish to install columns. Personalised fencing, practice walls, retaining walls, patio areas, paths and landscaping are just some of our additional services here at Sovereign Sports. To find out more about our all-weather sporting surfaces and tennis courts as well as renovating existing courts and maintenance services in Canterbury, call Sovereign Sports today on 01634 684 235 or fill out the provided contact form below and our friendly team will be happy to help. 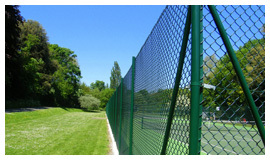 Our company provides two systems as standard, tubular or angle iron powder coated in either green or black, installed around the perimeter of the court to a height of a 2.75m (9ft). There is a vast array of fencing systems on the market today, so if you have something in mind please don’t hesitate to contact us. All surfaces need regular maintenance to retain good condition, whether it is porous macadam, synthetic clay, synthetic grass. Every surface should be swept clean and all leaves, pine needles, detritus and rubbish should be removed on a weekly basis. Sovereign Sports are able to offer 2 types of lighting system, Static or Retractable. Our retractable system is aimed more at the private client, being less obtrusive than the full size static option. The static system we offer complies with SAPCA and LTA recommendations and is the preferred choice for clubs and schools. Along with our main concern, being the construction of tennis courts and sports surfaces. 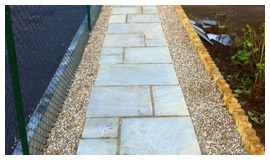 We also carry out a wide range of associated works and optional extras which include double edge perimeters, personalised fencing posts, practice walls, retaining walls, paths, patio areas, steps and landscaping to the surround of the court.